Sometimes, it takes half the world and 22 years to realize your spot in the craft you hold dear, but when you get there, you’ll know that the journey is worth it. Lisa Richards is not your ordinary singer/songwriter. 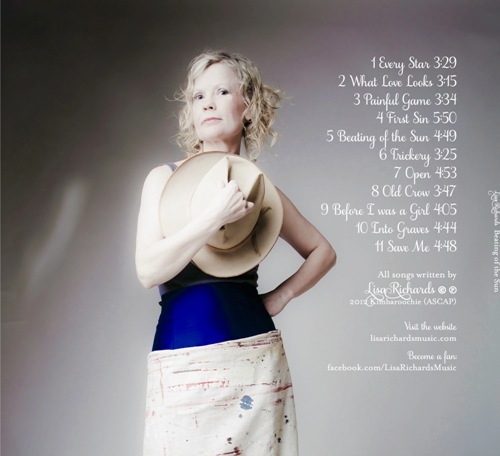 This Queensland native has been honing her music for decades with five recorded albums under her belt and years of touring while based in New York City and Austin, Texas. She has rounded the festival circuits in the U.S. and has also brought her music to the U.K., Netherlands, Belgium, and Australia. Now, Lisa’s distinct voice, akin to great artist such as Billie Holiday and Suzanne Vega, is back in Beating of the Sun. “Singing makes me feel like I am flying. When I sing, I step into myself in a different way. I can be free and strong, ugly and beautiful, sweet and angry, clumsy and graceful, perfect and imperfect – mostly imperfect! It allows me to say what I feel even when I don’t know what that is,” says Lisa on her website. Featuring 11 tracks, Beating of the Sun celebrates the understated beauty of folk, blues, jazz, and country while giving listeners a sense of wonder in the stories weaved in every song. Every Star welcomes the ears with raw acoustic strings that sways waywardly along honest verses. Listen as Lisa churns out textured yet tender vocals that sink deep into the ears, leaving a stir of emotions in every note. Meanwhile, First Sin transports the listeners to the old country with a serene blend of pipes and intricate strings. Lisa’s sound gives a sense of familiarity by fostering an intimate personal connection between the verses and the listener. Trickery features layers of spirited acoustic folk that pauses and burst organically to highlight Lisa’s tough and snappy delivery. The track’s arrangement magnifies a balance between relaxed and playful musicality. Lastly, Save Me puts Lisa in a hushed yet robust arrangement where raw, primal guitar tunes slow down so that Lisa could savor every word on her lips. All in all, Beating of the Sun is a culmination of Lisa Richards‘ music and how she found her niche in soft folk tunes and warm harmonies that feel like home. Lisa is now ready to record her new album and she needs YOUR help to crowd fund the production costs. She only needs A$10,000 and she is more than half way there! Support independent artists – especially the once who share their work with you for free and under Creative Commons Licenses – donate to her campaign NOW!